Chris Bickley has always been happiest when sharing his love of music. That’s true not only when performing, but when teaching or even providing the tools of the trade to youngsters interested in becoming musicians themselves. Bickley had previously instructed the Northwestern Michigan College jazz band and led the Reef Petroleum Big Band in the Traverse City area back in the ’80s. He left the area for Central Michigan University and then Grand Rapids before returning. “When I moved back here I wanted to bring that all together,” he says. 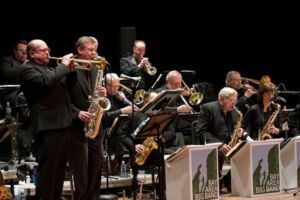 Officially recognized as a non-profit in October of 2009, the Bay Area Music Foundation is separate from but related to the Bay Area Big Band, which consists of several of the region’s prominent jazz musicians. It helps put a face on the foundation. “The band is independent but affiliated with the foundation. We do about 10 shows per year,” Bickley says. Many of those shows are done as benefits. Last year the band performed a holiday show with Scottville native Edgar Struble, a longtime friend of Bickley’s who has served as the musical director for Kenny Rogers and composed and directed the music numerous awards shows. Proceeds from the concert were donated by the foundation to the Traverse Symphony Orchestra to fund youth and civic orchestra programs. Other times the benefits are more direct. Bickley and his cohorts pick up instruments at yard sales and flea markets or receive donations from people who want them to be used rather than gather dust in a basement or attic. They are refurbished as necessary and then given to youngsters who have interest and aptitude for music but may be unable to procure their own instrument. The foundation recently donated a three-quarter cello to Pathfinder School and a euphonium to Forest Area Public School. “There’s only so much schools can do,” Bickley says. In addition to instruments, the foundation also provides scholarships for private instruction and music camps. Bickley has played and led bands everywhere he’s lived. He was in Grand Rapids when the swing revival in the ’90s led to groups such as the Royal Crown Revue and Squirrel Nut Zippers packing theatres and dance floors. “There was the Brian Setzer Orchestra and Big Bad Voodoo Daddy, so I had the Zoot Boogie Band,” he recalls. Thus it was only natural that upon moving back to Traverse City, he began looking at a way to create a band while formalizing the educational, philanthropic and cultural outreach programs he was interested in. The result was the Bay Area Big Band. “We are so blessed in Northern Michigan. I’m still amazed at the caliber of the musicians,” he says. Like Bickley, many members of the band are educators as well as top-flight performers. That includes people like pianist Steve Stargardt, who retired from Traverse City Christian School; saxophonist Laurie Sears, a private instructor who directs the NMC Jazz Bands; and Mike Hunter, who teaches at Blue Lake Fine Arts Camp and also gives lessons. Hunter, who was previously the head of the jazz programs at NMC for more than two decades, says the group is comprised of a number of fine players who have shared their knowledge and passion with students of all ages. “The whole trombone section, most of the trumpets—there are a number of players who are or were educators,” says Hunter, the band’s lead trombonist. And like many of the musicians in the band, Hunter is active in other musical arenas, arranging music for the Traverse City Rotary Show and gigging around the area with a quintet that features Stargardt on keyboards and Bickley on woodwinds. The Bay Area Music Foundation’s nine-member board includes several active area musicians, such as Larry Avery, George Bliss (who co-founded the foundation with Bickley) and another former NMC jazz instructor, Pete Asch; the latter two are also members of the Bay Area Big Band as well.